“Humidity can be a curl’s best friend or your worst nightmare, depending on what you want to achieve,” says stylist Philip Pelusi, who owns 13 salons in the Pittsburgh area and is the developer of the Phyto-Life line of products. In most cases, it’s not the curls that bother people – it’s the frizz. “If you control the frizz, you’ll love the curl,” says curl stylist Jonathan Torch of Curly Hair Solutions. It can be the ideal time to accentuate curls, says Rodney Cutler of Cutler Salon-Redken in New York. He points out that the best curls often are behind the ears where it’s hotter and damper. Proper care, a good cut and the right products are the keys to making humidity work for you, rather than against you. Curl experts all agree that it is especially important to moisturize hair during the humid summer months. A rough, dry cuticle has a tendency to get frizzy. Don’t shampoo every day because the hair needs the oils. When you do, make sure to use a more moisturizing formula. Or you can go no shampoo. Deep conditioning at least once a week is a must. Leave-in conditioners also work especially well during the summer months because they keep the moisture in the hair. They can even be applied throughout the day if it begins to frizz up. Ouidad suggests adding some conditioner to a gel to provide added manageability. Don’t shampoo every day because the hair needs the oils. When you do, make sure to use a more moisturizing formula. Torch believes frizz is caused by water molecules sitting on top of the hair’s cuticle, acting like a barrier. He believes the key is learning how to get the water into the cuticle. Heavy products are a no-no, Pelusi says. They can create buildup, which can dry the hair out making it look frizzier. A number of new styling products use the latest technologies to enhance nature. Lightweight, water-soluble silicones may work well for some types of curly hair by smoothing the cuticle without causing buildup. Proper application of the product is especially important. Christo suggests dividing the hair into three sections, distrubting the product first to the back, then to the sides and finally to the top layer. That insures that every hair receives the benefit of the product. Those who want to straighten their hair during the summer should stay away from products that contain humectants. Using a round brush, blow the hair dry and use flattening iron to get it straight. 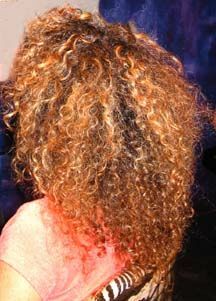 Also, avoid spritzers and heavy hairsprays, which can make the hair frizzier and cause the curl to spring back. A good haircut is especially important during the summer. Curly hair that's all one length can look too triangular and has a tendency to bush out. “Generally speaking, with curly hair, you want longer layers when there’s a lot of humidity,” says Lisa Garcia of the Color Salon, a Farouk Systems educator. She recommends point-cut layers or undercutting the bottom layer to help the curls blend better. Rather than thinning the hair, which can create shelves or cut marks, point cutting the hair helps reduce the bulk. And it may need to be cut more often. Christo suggests every six weeks for short hair and every eight weeks for longer curls. “That allows you to clean up the split ends where the frizz begins,” he says. But even with the best products and haircuts, there will be those days when nothing seems to keep the frizz at bay. Knowing how to style curly hair is essential in hot, humid weather. Ponytails and braids are a great option, Christo says. “If you know the weather is going to be a problem, pull the hair softly off your face and accessorize it,” he says. In emergencies, Pelusi recommends wearing a wide headband to keep the hair down. Another trick is to twist the hair and make several ponytails around the head, allowing it to dry like that. That can reduce some of the “puff.” Braiding the hair while it’s wet also can be helpful in reducing frizz, creating beautiful waves. A spray bottle of water can be a lifesaver, reactivating products and reducing the frizz. Torch suggests taking water in your hands and rubbing wet hands across the frizzy areas. Usually, it is unnecessary to apply more product. One of Ouidad’s favorite tricks -- one she often uses herself -- is to apply some of her Deep Treatment and slick it back into a bun, with a few tendrils framing her face. It controls the hair while conditioning it. Cutler recommends taking large sections of hair -- roughly 4 inches -- and wrapping them in your hands, tucking the ends under, pinning them, and leaving them until they’re dry. Whether the hair air dries or you diffuse it, don’t touch it until it’s 80 percent dry. Then take out the pins and rake the curls out. “You’ll have beautiful Giselle-type curls,” he says. A medium set of curling irons also can be a godsend, Cutler says. He suggests grabbing the hair in large sections and wrapping it around the curling iron, twirling it around like you would a pole. Blend it together. Then lightly shampoo and apply the protein shake. Let it sit for 15 minutes and rinse it out with a light shampoo and a daily conditioner. Repeat every one to two weeks.